At Nordex, we are proud to offer the highest quality printed blank CDs and DVDs. 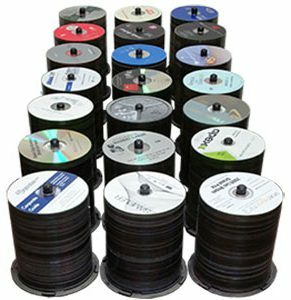 Printed Blank CDs & DVDs with your company logo will increase visibility and build customer loyalty for your brand or company. Custom CDs & DVDs will help you attract new customers and will help you leave a long lasting positive impression. Whether you want to use the customized CDs and DVDs as business cards or as a customized data storage for your clients, these pre-printed blank disks will help you establish a strong relationship with your clients. Reliable service and performance from a dedicated team. State-of-the-art printing equipment using the highest quality materials. We offer a one-stop-shop to fulfill your project needs & requirements. * Prices Shown are Per 1 Single Unit Disc. * One-Time Setup Fee of $20/Color is required.